Belle villa individuelle sur un terrain spacieux, calme, clos et sécurisé de 1000 m². Sur un seul niveau, il ya un salon spacieux, avec cuisine entièrement équipée (cuisinière, barbecue, micro-ondes, réfrigérateur / congélateur, lave-linge). chambre de maître avec salle de bains complète, une autre chambre double, 2 chambres avec lits jumeaux, salle de bain complète et une salle de douche. Toutes les chambres ont placards, une commode et des ventilateurs électriques. La villa dispose d'une piscine privée, terrasse côté avec table et chaises (avec grand parasol), ainsi que d'une salle à manger sous la pagode, et un barbecue. Le porche donne un endroit ombragé pour s'asseoir pendant la journée, donnant sur la piscine, et il ya aussi une terrasse sur le toit. TV avec lecteur DVD et chaîne stéréo dans le salon. Fumeurs - Dans porche et à l'extérieur seulement s'il vous plaît. We were in Spain to celebrate a 80th Birthday, and found this Villa. 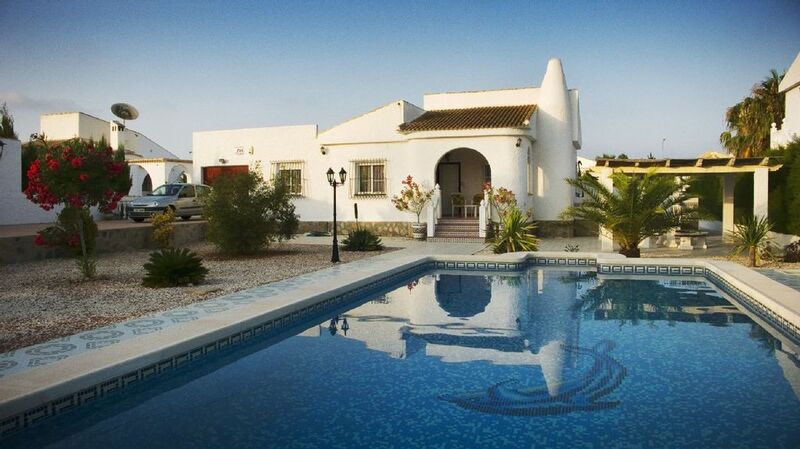 From start the owner Paul was very helpful, and we were very pleased with the Villa. It had everything you needed, and although we went 1st weekend in December the weather was amazing 24Deg. There was 3 bathrooms which was great was great when there are 8 of you. We will definatley use this property again, and cant wait to experience the Swimming Pool which was very tempting. Also the arrangements for collecting keys was very smooth,. Lovely spacious villa, clean & well maintained on a quiet road in the San Louise area of Torrevieja, fabulous pool, plenty of out door eating areas with new BBQ, all mod cons, 5 -10 minutes walk from good local bars, restaurants supermarket, 20 minutes on the bus to beach resort in Torrevieja with plenty of restaurants & bars.10 minutes walk from the villa is the " Villa Salada" where you can eat & watch a fabulous horse show, if you love horses this show is a must. Down side great pool but not small child friendly, overall great holiday villa for a real chill out holiday. We Always Stipulate that the pool needs parental Supervision at all times.. we cant keep our 6 year old out of it! We are just back from a week at La Casa Del Sol. We took our two foster children, aged 9 & 10, and our son, who is 14. The younger children had never been abroad before, so we were quite worried about how they would cope with Spain. It turned out to be the best holiday we have had with them. The villa was spacious and had everything we needed. The pool and grounds were amazing. We reckon the children were in the pool for about six hours most days! There was plenty to do in the area - we hired a car and went into Torrevieja several times in the evenings, we also drove to Calla Cortina and Guardamar del Segura beaches, which were lovely in different ways. Calla Cortina for snorkelling, jumping off rocks etc and Guardamar for the incredibly warm sea and soft sand. We also visited Aquaopolis water park which we thought was good value for money, although when you've got a pool at home…..not sure we really needed to go there. The villa itself was very clean - spotless in fact. Paul, the manager was an excellent guide. We were very pleased we'd arranged for him to pick us up at the airport as he gave us loads of tips about places to eat and visit. He was also helpful with getting us to the car hire office and was always on time and very polite. We felt we could have approached him with any problems which arose - luckily there weren't any. We thoroughly recommend the villa to anybody considering it. We all felt we could escape and find our on space when we needed to, but the communal areas were lovely too. The jewel in the crown is the pool - absolute bliss and really well maintained. Thanks for your review. So glad you really enjoyed your time at the villa.. And You certainly made the most of your time in Spain with all the exploring too! I arrived with my elderly parents and 3 teenagers and we absolutely loved it from start to finish.Well equipped villa with a stunning pool and gardens. Great service from the agents who were on time to the minute and prompt to deal with any requests. A very quiet area, perfect for us and the free WI FI was useful for the younger members.We hired a car for convenience mostly , visiting a couple of beaches and doing food shopping but the car was parked in the drive on the whole as we were so happy staying by this gorgeous pool. Near by town, Torreveija, was easily reached by taxi or bus so that teenagers can dip into a bit of night life if they want to. Stunning Pink salt lakes within 10 mins walk fascinated me and my camera got plenty of use . We mostly BBQ'd (gas ) but did try a couple of the local restaurants ..Indian ,Chinese ,Chicken shack and fabulous Tapas . The local water park was also great fun and suitable for teenagers ,there is another for younger kids but we didn't try that obviously . On the whole a fabulous villa , a wonderful place for a family holiday ..safe ,clean and no fighting for sunbeds in a morning . Having visited the area before, we were keen to find a villa that catered for a family, this was ideal. Great location, away from the main tourist noise but close enough to enjoy the local attractions. The villa was clean and fully equipped, we hired a car and were met by the managers, who were friendly and informative. The pool was great, the gardens pretty and plenty of parking for the hire car. The villa has several bars and restaurants within walking distance, however we visited Torrevieja and Guandamar, which we loved. The beaches are clean and the bars good value for money. We did eat in the villa, just 10 minutes walk away is a Mercadona, whilst the staff don't speak english, you can get everything you need. The villa has everything you need for cooking a family meal. We will definately being visiting again and can highly recommend. The owners make the booking process simple and straight forward. San Luis est une zone résidentielle établie située à côté des magnifiques lacs salés aux frontières de Torreveija. San Luis a sa propre sélection locale de magasins, bars et restaurants, supermarchés et banques .... Tous à 5 minutes à pied de la villa. À proximité se trouve La Siesta, où vous trouverez un superbe parc aquatique (ouvert de juin à septembre), qui ravira les enfants. Les plages spacieuses se trouvent à Guardamar et sont accessibles en 10 minutes en voiture. Le centre-ville de Torrevieja avec sa promenade animée, ses bars et ses restaurants est à 7 minutes en voiture. San Luis est une base idéale pour explorer la Costa Blanca avec Calpe et Benidorm à une heure de route au nord, et La Manga et Carthagène à moins d’une heure au sud.